As we blast through systems delivering justice Hulk by Hulk and Mackinaw by Mackinaw, many carebears decide to "Skiff up" for safety reasons. The Skiff, when fitted properly, can sport a tank the size of an orca or freighter. 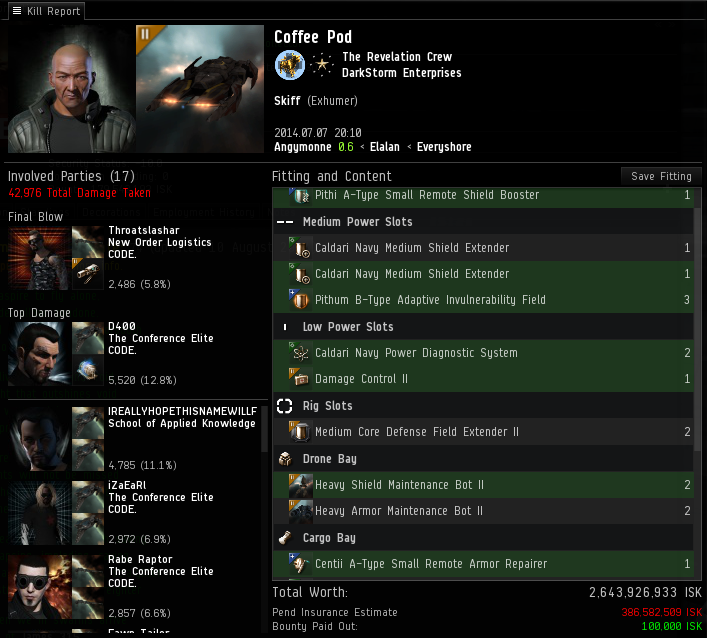 Coffee Pod decided to stack his Skiff with expensive tanking modules but unfortunately forgot the most important tanking module (his permit) and so was vaporized. 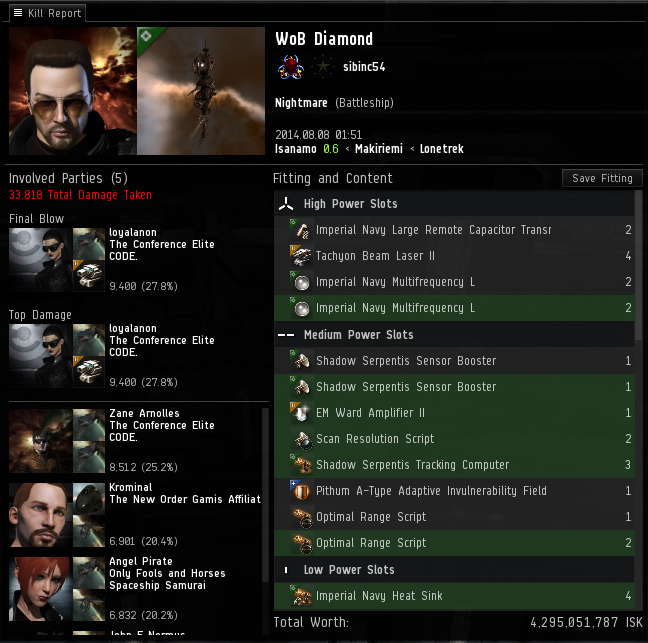 They don't make any tanking modules more powerful than a permit, and it only costs 10 million ISK! 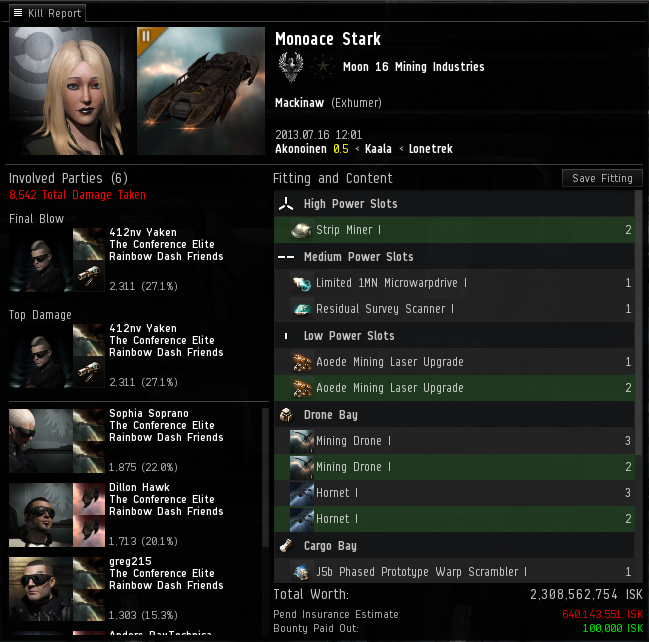 Monoace Stark thought she'd be clever and mine AFK in New Order space without a permit. Loyalanon, 412nv Yaken, and their crew of trained murderers vaporized her within seconds. Attempts to convert her to the light failed, as she rebelliously reappeared with an equally expensive ship. Sadly she was also equally as AFK and was subsequently obliterated once more. Some carebears just need to be taught twice to realize that crime doesn't pay. Top Freighter Kill - Coming soon! Oftentimes after we destroy a miner or a hauler, the recently-punished criminal will suggest we never kill people that can shoot back. 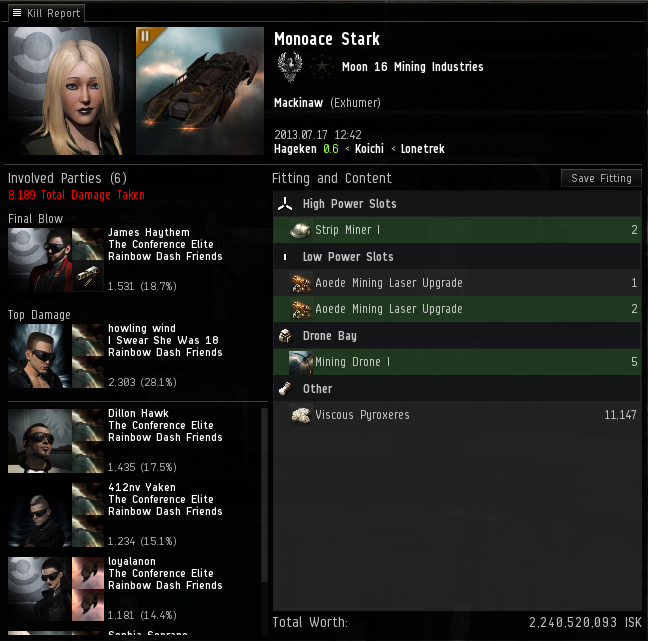 You see, some people forget that The Law of Highsec also applies to people running incursions and in missions. WoB Diamond thought he was above the law in his expensive combat ship. Loyalanon and his crew reminded him that he was dead wrong. Turns out the guns didn't help. If there's one thing The Code should teach you, its not to let your client play the game for you. Graadul decided he'd risk it anyways and lost his capsule autopiloting to D400. 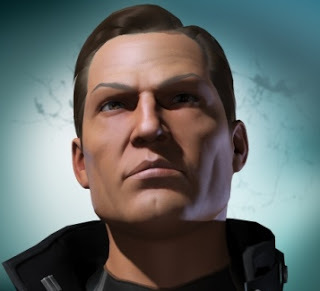 If he had just purchased a permit and played the game as it was intended (while at the computer), his pod would be improved on the order of about 9-billion ISK. D400 is a master at his craft. 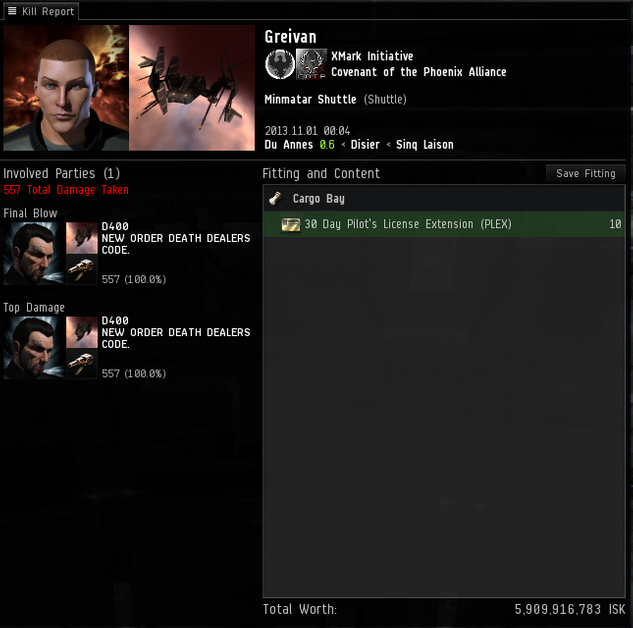 Greivan decided he'd haul 10 PLEX to Jita, presumably to squeeze a couple million more ISK out of his sale. The greed of the carebear knows no limit, but despite remembering to be at his computer, Greivan forgot his permit on the way there. D400 caught him with an instalock thrasher and cut 10 month's off the carebear's life. He promptly donated them to the Asian relief effort through the CCP donation part on their page. He, like his brothers in CODE., isn't in it for the profit. He's in it for a better EVE. Worst Fit - Coming soon!